The Baltic Earth Assessment of Climate Change (BACC) in the Baltic Sea region is an effort to establish what scientifically legitimised knowledge about climate change and its impacts is available for the Baltic Sea catchment. Observed past and projected future changes in atmospheric, hydrological, and oceanographic conditions are assessed, as well as the observed and potential impacts on the natural and socio-economic environments. The BACC programme focuses purely on the science and does not draw conclusions about the political, economic, or management consequences of the scientific knowledge. This report (the BACC II assessment, the follow-up to the BACC I assessment in 2008) documents the consensus and dissensus on climate knowledge up to about 2012. More than 180 researchers contributed in various functions to this peer-reviewed assessment. The process was overseen by a scientific steering committee and coordinated by the International Baltic Earth Secretariat. The Baltic Earth1 Assessment of Climate Change (BACC) in the Baltic Sea region is an effort to establish what scientifically legitimised knowledge about climate change and its impacts is available for the Baltic Sea catchment. Observed past and projected future changes in atmospheric, hydrological, and oceanographic conditions are assessed, as well as the observed and potential impacts on the natural and socio-economic environments. The assessment has been used by the intergovernmental Baltic Marine Environment Protection Commission (HELCOM) as a basis for its deliberations. A division of labour has been established between BACC and HELCOM: the BACC programme focuses purely on the science and does not draw conclusions about the political, economic or management consequences of the scientific knowledge, while HELCOM accepts the BACC findings and uses them in its work within the political negotiation processes. HELCOM used the outcome of the present BACC II assessment in its Thematic Report on Climate Change published in 2013 (HELCOM 2013), once BACC had reached final agreement on its findings, but before various editorial tasks were complete. The first BACC assessment report was published in 2008 (BACC Author Team 2008) and was accompanied by a Thematic Report by HELCOM published the previous year (HELCOM 2007). 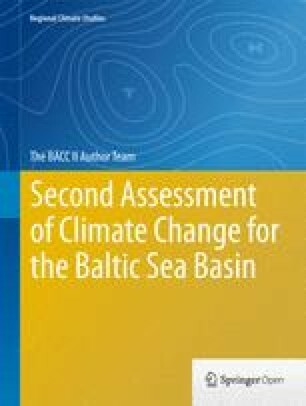 For the first BACC book, approximately 80 scientists from 12 countries researched and assessed the available literature on climate change in the Baltic Sea basin. BACC II follows the BACC I format in documenting the consensus and dissensus on climate knowledge up to about 2012. New aspects in BACC II are a consideration of the long-term and recent historical past to provide a framework for evaluating the severity and unusualness of the current climate change, a detailed analysis of sea-level changes in the Baltic Sea, a description of climate change effects on urban complexes , and a reflection on detection and attribution of regional climate change in the Baltic Sea region. For the present assessment, more than 180 researchers contributed in various functions, from the lead and contributing authors and reviewers to the overseeing of the process by the Scientific Steering Committee and coordination by the International Baltic Earth Secretariat. The Baltic Sea region is warming, and the warming is almost certain to continue throughout the twenty-first century. It is plausible that the warming is at least partly related to anthropogenic factors. So far, and as is likely to be the case for the next few decades, the signal is limited to temperature and to directly related variables, such as ice conditions. Changes in the hydrological cycle are expected to become obvious in the coming decades. The regional warming is almost certain to have a variety of effects on terrestrial and marine ecosystems—some will be more predictable (such as the changes in phenology) than others. The results of the BACC I assessment remain valid. Significant additional material has been found and assessed. Some previously contested issues have been resolved (such as trends in sea-surface temperature) . The use of multi-model ensembles seems to be a major improvement; there are first detection studies, but attribution is still weak. Regional climate models still suffer from biases related to the heat and water balances. The effect of changing atmospheric aerosol load to date cannot be described; first efforts at describing the effect of land-use change have now been done. Data homogeneity is still a problem and is sometimes not taken seriously enough. The issue of multiple drivers on ecosystems and socio-economics is recognised, but more efforts to deal with them are needed. In many cases, the relative importance of different drivers of change, not only climate change, needs to be evaluated (e.g. atmospheric and aquatic pollution and eutrophication , overfishing , and changes in land cover). Estimates of future concentrations and deposition of substances such as sulphur and nitrogen oxides, ammonia /ammonium, ozone, and carbon dioxide depend on future emissions and climate conditions. Atmospheric warming seems relatively less important than changes in emissions. The specification of future emissions is plausibly the biggest source of uncertainty when attempting to project future deposition or ocean acidification . In the narrow coastal zone, the combination of climate change and land uplift acting together creates a particularly challenging situation for plant and animal communities in terms of adaptation to changing environmental conditions. Climate change is a compounding factor for major drivers of changes in freshwater biogeochemistry, but evidence is still often based on small-scale studies in time and space. The effect of climate change cannot yet be quantified on a basin-wide scale. Climate model scenarios show a tendency towards future reduced salinity , but due to the large bias in the water balance projections, it is still uncertain whether the Baltic Sea will become less or more saline. Scenario simulations suggest that the Baltic Sea water may become more acidic in the future. Increased oxygen deficiency, increased temperature , changed salinity, and increased ocean acidification are expected to affect the marine ecosystem in various ways and may erode the resilience of the ecosystem. When addressing climate change impacts on, for example, forestry , agriculture, urban complexes , and the marine environment in the Baltic Sea basin, a broad perspective is needed which considers not only climate change but also other significant factors such as changes in emissions, demographic and economic changes, and changes in land use . Palaeoecological ‘proxy ’ data indicate that the major change in anthropogenic land cover in the Baltic Sea catchment area occurred more than two thousand years ago. Climate model studies indicate that past anthropogenic land-cover change had a significant impact on past climate in the northern hemisphere and the Baltic Sea region, but there is no evidence that land-cover change since AD 1850 was even partly responsible for driving the recent climate warming. The overall format of the BACC process is similar to the process for assessments undertaken by the Intergovernmental Panel on Climate Change (IPCC), with author groups for the individual chapters, an overall summary for policymakers (here: the executive summary in Sect. 1.2) and a peer-reviewed process. The assessment is a synthesis of material drawn entirely from the available scientifically legitimate literature (e.g. peer-reviewed literature, conference proceedings, and reports of scientific institutes). Influence or funding from groups with a political, economic, or ideological agenda is not allowed; however, questions from such groups are welcome. If a consensus view cannot be found in the above-defined literature, this is clearly stated and the differing views are documented. The assessment thus encompasses the knowledge about what scientists agree on but also identifies cases of disagreement or knowledge gaps. The assessment is evaluated by independent scientific reviewers. The BACC process was overseen by a Science Steering Committee (SSC) and managed by the International Baltic Earth Secretariat. The role of the BACC II SSC was to formulate a plan for the BACC II assessment and the outline topics to be addressed. The SSC was responsible for selecting Lead Authors for each specific topic. It was also responsible for overseeing the review process. The International Baltic Earth Secretariat was the focal point regarding the logistics of the review process, meetings, and technical writing. Of particular importance was the full availability of information, including text material for all participants in the BACC II writing process and representatives of HELCOM. A dedicated BACC II website is available at www.baltic-earth.eu/BACC2/, including a password-protected page that was used for the exchange of internal information and documents (e.g. draft chapters). Lead Authors were invited by the BACC II SSC to prepare chapters on the basis of currently available scientific knowledge. The Lead Authors are responsible for the overall quality and content of their chapter. This applies even if they formed a writing team to help draft the chapter. The essence of the Lead Authors task was the synthesis of material drawn entirely from the available scientifically legitimate literature (e.g. peer-reviewed literature, conference proceedings, and reports of scientific institutes). It took about four years to complete the assessment, which concludes with the publication of this book. The process started in April 2010, when the BACC II SSC was formed and the BACC II Lead Authors were nominated at a meeting in Lund, Sweden. In June 2010, the BACC II programme was presented and discussed by the scientific community at the 6th BALTEX Study Conference in Międzyzdroje, Poland. The first meeting of Lead Authors took place in Gothenburg, Sweden in November 2010; the second meeting in Hamburg, Germany in March 2011. In 2011, the assessment work was begun by the Lead and Contributing Authors, and in February 2012, the third meeting of Lead Authors took place in Copenhagen, Denmark. In May 2012, BACC II was presented at the BONUS Workshop at the European Maritime Day in Gothenburg and the first drafts of the BACC II chapters became available in mid-2012. The chapters were reviewed at a dedicated BACC II Review/Stakeholder Conference in Tallinn, Estonia, in September 2012. The external peer review was completed by the end of 2012. By March 2013, the chapters had been revised according to the reviewers’ comments. The final text was published as a print and open access book in early 2015. The BACC II assessment uses the following terminology as defined here. Climate change: Deterministic response to changes in external climate forcing. Internal variability: Random fluctuations independent of external forcing . Detection : The observed climate change is unlikely due to internal variability alone = Detection of (some) external forcing. Attribution: Mix of plausible external forcing mechanisms that best explain the detected change. This report features two annexes. Annex 1 provides a short mathematical definition of the scientific concept of ‘Detection and Attribution’. Annex 2 deals with the impact of the BACC I report within the regional scientific community and among decision-makers with responsibility for the German Baltic Sea coast. In short, it is a peer assessment of the BACC I report and a policy decision-makers’ assessment of the state of the region, their sources of scientific information, and the utility of the information contained in the report. While the scientific peer review indicated overall satisfaction, it was clear that the report would require significant changes to be of maximum use for decision-makers. However, this is not surprising since the intended audience for the book was primarily the scientific community. In addition to this introductory chapter, the report comprises six major sections. The first two chapters of this report provide a broad overview of the geo-historical development of conditions in the past millennia, based on proxy data from sources such as fossil pollen and insects from dated continental and lake sediments, tree ring widths and density, and some written records or diaries. The Baltic Sea is a young sea. It was formed after the glaciers that covered this area for over 100,000 years began to recede about 18,000 years ago, mainly as a result of changes in the orbital configuration of the Earth’s rotation around the sun. In the Baltic Sea area, this last Ice Age ended about 11,000 years ago. During the following warmer Holocene , the Baltic Sea basin underwent a number of major changes owing to the gradual melting of the Fennoscandian ice sheet, which caused a rise in sea level and the slow isostatic uplift of the land readjusting to the disappearance of the heavy ice sheet, thus decreasing relative sea level. The interplay between these two processes led to a series of transitions in the Baltic Sea basin, varying between a freshwater lake during periods of isolation from the North Sea and a brackish sea when water mass exchange with the saline North Sea occurred. The melting of the ice sheets in North America had an influence on oceanic circulation , and it is believed that large volumes of cold water from the melting ice sheets entering the North Atlantic Ocean exerted an abrupt cooling around 8200 years ago that lasted several centuries in the Baltic Sea area. Changes in the orbital configuration of the Earth also modulated the incoming solar insolation of the boreal high latitudes and thus strongly influenced the regional energy balance. The summer solar insolation peaked at around 7000–6000 years ago and subsequently decreased. After the melting of the remnants of the Fennoscandian ice sheets, a relatively stable period occurred around 7500–5500 years ago, with summer temperatures 1.0–3.5 °C higher than at present. Since then, a continued decreasing trend in summer solar insolation due to astronomical factors has resulted in a more unstable climate and a progressive millennial cooling. Other external and internal factors influencing the climate of the Baltic Sea basin during the Holocene include variations in the concentrations of stratospheric aerosols induced by volcanic activity , changes in the concentrations of greenhouse gases (GHGs) in the atmosphere due to natural factors, changes in the surface albedo of the sea and changes in the vegetation of the surrounding land, and salinity-induced changes in the intensity and type of circulation in the sea. In the Baltic Sea basin and surrounding areas of Europe, relatively stable climate conditions prevailed in the tenth and eleventh centuries, typified by warm, dry summers. Investigations in Fennoscandia indicate that a so-called Medieval Warm Period (MWP) occurred between AD 900 and 1350; at that time, warm-season (May–September) temperatures exceeded the contemporary warming at the end of the twentieth century by about +0.5 °C. An exceptionally warm period occurred from AD 1200–1250. The climate of the past 500 years has been characterised by centennial-scale variability and the modulation of interannual and decadal signals, often accompanied by rapid shifts. In the latter half of the sixteenth century, the temperature dropped, initiating the Little Ice Age . In the recently modelled and reconstructed northern Scandinavian summer temperatures since 1500, the longest cool period prevailed during the first half of the seventeenth century and at the beginning of the eighteenth century, as well as during the first years of the nineteenth century. During these main historical climatic periods, climatic conditions were not uniform and shorter warm/cool and wet/dry fluctuations were observed depending on regional factors. The six chapters of this section describe the observed climatic changes in the atmosphere, on land (river run-off , cryosphere ) and at sea (circulation and stratification , sea ice , sea level and wind waves ) for properties in the Baltic Sea drainage basin over the past 200–300 years. The Baltic Sea has a dense observation network covering an extended time period, and measurements of environmental conditions have been made with increasing accuracy over this period. Continuous time series exist since the middle of the eighteenth century for a few stations, and a denser network of stations has been operational since the mid-nineteenth century. The Baltic Sea region features very variable weather conditions due to its location in the extra-tropics of the northern hemisphere. The region is controlled by two large-scale pressure systems over the north-eastern Atlantic Ocean—the Icelandic Low and the Azores High. In general, westerly winds predominate, although any other wind direction is also frequently observed. As the climate of the Baltic Sea basin is to a large extent controlled by the prevailing air masses, atmospheric conditions will therefore be controlled by global climate as well as by regional circulation patterns, and the atmospheric parameters are strongly interlinked. The large-scale circulation patterns in the Baltic Sea region are influenced by the North Atlantic Oscillation (NAO), which is the dominant mode of near-surface pressure variability over the North Atlantic Ocean and neighbouring land masses, particularly during winter. In its positive phase, the Icelandic Low and Azores High are strengthened, resulting in a stronger than normal westerly airflow on a more northerly tract over the eastern North Atlantic and Europe; this brings warm, wet winters to all of Europe except for the southern part. When both the Icelandic Low and the Azores High are weak, termed a negative NAO, the westerly airflows are also weak, resulting in colder, drier winters in northern Europe. The NAO shows considerable seasonal and interannual variability , with prolonged periods of positive or negative phases. Although the NAO shows long-term variability, from the mid-1960s to the mid-1990s it was in a generally positive phase, with stronger westerly winds, mild and wet winters, and increased storminess in the Baltic Sea area. After the mid-1990s, there was a trend towards more negative NAO values, resulting in weak westerly airflows and weather types that appear to be more persistent than in earlier decades. The wind climate is generally related to large-scale variations in the atmospheric circulation of the North Atlantic, including the NAO in winter. Overall, reconstructions for the past 200 years show that storminess in northern Europe is dominated by large multi-decadal variations rather than by long-term trends. However, during the latter half of the twentieth century, large changes were observed in the wind climate over the North-east Atlantic and northern Europe. An unusually calm period occurred during the early 1970s; this coincided with a period with strongly negative NAO values as well as a very high frequency of Euro-Atlantic atmospheric blocking in winter, preventing or weakening westerly flow and leading to low wind speeds and fewer storms over Scandinavia. This was followed by a strong increase in annual and winter-to-spring storminess with unprecedented high winter storminess in the 1980s and early 1990s, during which the NAO index reached very high values. In the first decade of the twenty-first century, wind speeds returned to average values in the Baltic Sea area. A northward shift in storm tracks and increased cyclonic activity have been observed in recent decades with an increased persistence of weather types. No long-term trend has been observed in annual wind statistics since the nineteenth century, but considerable variations on (multi-) decadal timescales. An anthropogenic influence cannot be excluded since the middle of the twentieth century. The pattern in wind and wave heights over the northern hemisphere with a north-easterly shift of storm tracks appears to be consistent with combined natural and external forcing . There has been a clear increase in surface air temperature in the Baltic Sea basin since the beginning of the observational record in 1871. This has occurred with large multi-decadal variations dividing the twentieth century into three phases: warming until the 1930s, followed by cooling until the 1960s, and then another distinct warming during the final decades of the century. Linear trends in the annual mean temperature anomalies from 1871 to 2011 were 0.11 °C per decade north of 60°N and 0.08 °C per decade south of 60°N in the Baltic Sea basin. All seasonal trends are positive and statistically significant except for winter temperature north of 60°N. These trends are shown in Fig. 1.1. An analysis of temperature trends from 1970 to 2008 in the Baltic Sea area showed the strongest increase in the Gulf of Bothnia in autumn and winter (+0.5 to +0.6 °C per decade), while significant changes occurred during spring and summer in the central and southern parts of the Baltic Sea area (+0.2 to +0.3 °C per decade). During the past decade, the warming has continued during spring and summer in the southern parts and during autumn and spring in the northern parts, but the winters of 2009/10 and 2010/11 were very cold. Seasonal changes are also evident: the duration of the growing season has increased, and the duration of the cold season has decreased. For instance, in Tartu, Estonia, the number of deep winter days (with snow cover) decreased by 29 over the twentieth century, while the growing season increased by 13 days. For the Baltic States and Poland, there has been a significant increase in the number of hot days and nights and the number of heat waves , as well as a significant decrease in the number of frost days . No long-term trend was observed for precipitation, but there is some indication of an increased duration of precipitation periods and possibly an increased risk of extreme precipitation events. The amount of precipitation in the Baltic Sea area during the past century has varied between regions and seasons, with both increasing and decreasing precipitation apparent. A tendency of increasing precipitation in winter and spring was detected during the latter half of the twentieth century. Comparing the annual mean precipitation during 1994–2008 with that of 1979–1993 showed less precipitation in the northern and central Baltic Sea region and more in the southern region. The pattern also varied by season (Fig. 1.2). Mostly, positive trends in daily precipitation and precipitation totals were detected at 116 stations across Europe, including the Baltic Sea region, during 1950–2000. Although most of the trends are not statistically significant, some positive trends were identified for winter and spring, while negative trends mostly occurred in summer and, in some cases, in autumn. Generally, negative trends in cloudiness and coincident positive trends in sunshine duration and solar radiation in the major parts of the Baltic Sea basin have been detected over recent decades. However, the data are highly variable, and the number of investigations to date is not sufficient to enable more detailed and reliable conclusions. The Baltic Sea can be considered a large, semi-enclosed brackish water estuary draining into the North Sea via the Danish Straits. The inflow from rivers to the Baltic Sea is an important variable for both the physical, chemical, and ecological processes of the sea. In winter, much of the precipitation is stored as snow . Thus, in the north, discharges are lowest towards the end of winter before snowmelt . The highest discharges are recorded in spring or early summer owing to snowmelt. Water levels and discharges usually decrease during summer when evaporation and evapotranspiration are greatest and normally greater than precipitation. In some regions, river discharge is strongly influenced by hydropower , damping the seasonal cycle. Although decadal and regional variability is large, no statistically significant long-term change has been detected in total river run-off to the Baltic Sea during the past 500 years. An analysis of streamflow in a large number of rivers and streams in the Nordic countries over three periods from 1920 to 2002 generally showed that trends towards increased streamflow dominated annual values as well as the winter and spring seasons, while no trend was found for autumn. An indication of earlier snowmelt floods was also apparent. Although these trends in streamflow result from changes in both temperature and precipitation , temperature was shown to have a stronger effect. As an example, Fig. 1.3 shows annual anomalies and long-term variations in precipitation, temperature, water resources, and flood magnitude in Sweden for the period 1901–2010 in relation to the reference period 1961–1990. A decrease in annual discharge from southern catchments of the Baltic Sea of about 10 % has been observed from the rivers Nemunas (Lithuania), Neva (Russia), Vistula, and Oder (Poland) over the past century. The river ice regime is considered to be a sensitive indicator of climate change. A study of ice in the River Daugava (Latvia), which has a data series starting in 1530, showed a pronounced decreasing trend for the past 150 years with an even clearer trend for the past 30 years. This indicates a reduction of ice-cover duration and a shift to earlier ice break-up. The ice-cover duration has declined by 2.8–6.3 days per decade during the past 30 years. Although regional variations exist, similar observations have been made for other rivers flowing into the Baltic Sea. Both the ice regime and the seasonal river discharge are strongly influenced by large-scale atmospheric circulation processes over the North Atlantic, and this is shown by a close correlation with the NAO. Snow is the origin of a significant fraction of run-off in the Baltic Sea basin. Although there is large interannual variation in the extent of snow cover in the Baltic Sea drainage basin, a decreasing trend in snow-cover extent since the 1970s has been observed in Fennoscandia , with some regional exceptions. The duration of annual snow cover in western Scandinavia and in the south-western East European plain has also became shorter over the past century. In northern and eastern parts of the drainage basin, and in mountain regions where both precipitation and temperature control snow amount, colder average winters have led to an increase in annual snow depth . There was a tendency towards weaker spring floods in Latvia from 1951 to 2006 and stronger winter flows due to changes in snow-cover duration and snow amount. The current understanding of the spatial patterns of freeze/thaw cycles in the Baltic Sea region remains poor and has not been subject to systematic study. Some warming trends and some decreases in the duration and depth of seasonally frozen ground have been seen. Warming trends have been observed in the European permafrost , as well as a northward shift in the southern boundary of near-surface permafrost in European Russia. The Baltic Sea is well stratified, with a seasonal cycle of temperature superimposed on the more or less permanent two-layer salinity stratification. While temperature and sea ice respond rapidly to the changes in atmospheric heat fluxes, variations in salinity are governed mainly by lateral transport processes, resulting together with mixing in response times of many decades. Cold waters, formed during winter, extend down to the halocline which has a typical depth of 60–80 m in the Baltic Proper and somewhat less in the southern basins. During summer, when a seasonal thermocline develops in the surface waters at depths of about 15–20 m, the underlying cold intermediate layer generally retains a ‘memory’ of the severity of the previous winter. This layer is often referred to as ‘old winter water’. Deeper waters below the halocline are formed mainly by lateral advection of saline waters of North Sea origin that entrain and mix with ambient waters during their passage into and through the Baltic Sea. Below 100 m depth, the range in temperature variation within the Gotland Deep is only 5 °C (range 3–8 °C), compared to a range in surface temperature of up to 25 °C. A recent warming trend in sea-surface waters has been clearly demonstrated by in situ measurements, remote sensing data, and modelling results. In particular, remote sensing data for the period 1990–2008 indicate that the annual mean sea-surface temperature has increased by up to 1 °C per decade, with the greatest increase in the northern Bothnian Bay and large increases in the Gulf of Finland , the Gulf of Riga , and the northern Baltic Proper . Although the increase in the northern areas is affected by the recent decline in the extent and duration of sea ice , warming is still evident during all seasons and with the greatest increase occurring in summer. The least warming of surface waters (0.3–0.5 °C per decade) occurred north-east of Bornholm Island up to and along the Swedish coast, probably owing to an increase in the frequency of coastal upwelling . The latter is explained by the change in atmospheric circulation. Comparing observations with the results of centennial-scale modelling, recent changes in sea-water temperature appear to be within the range of the variability observed during the past 500 years (Fig. 1.4). Nonetheless, the twentieth century can be interpreted as the warmest, except for the warm anomaly around the 1730s. The salinity and stratification of the deep waters, governed by interacting circulation, transport, and mixing processes, are strongly linked to the major Baltic inflows of North Sea water that occur sporadically and bring high-saline water into the deep layers of the Baltic Sea. These major inflows are often followed by a period of stagnation during which saline stratification decreases and oxygen deficiency develops in the bottom waters. Major inflows normally occur during winter and spring; they bring relatively cold and oxygen-rich waters to the deep basins. Since 1996, several large inflows have occurred during summer. These inflows have transported high-saline, but warm and low-oxygen water into the deep layers of the Baltic Sea. Overall, a clear trend in salinity cannot be detected. Sea-ice conditions in the Baltic Sea have been systematically monitored for more than a century. The annual maximum ice extent of the Baltic Sea (MIB) is the most widely used indicator of sea-ice changes because it integrates winter period weather over the entire basin. A reconstruction based on various observational methods shows that the MIB displays large interannual variability owing to large-scale atmospheric circulation associated with the NAO (Fig. 1.5). A larger MIB occurs during negative NAO phases, while a smaller MIB occurs when the NAO is in a positive phase. All sea ice related parameters display large interannual variability, but a change towards milder ice winters has been observed over the past 100 years: in particular, the annual maximum ice extent has decreased and the length of the ice season has become shorter. However, a winter without any ice formation in the Baltic Sea is far from the present climatology. According to some 300 years of records of annual maximum sea-ice extent, the northernmost sub-basin, the Bothnian Bay , has been entirely ice-covered even during the mildest winters and the length of the ice season near the coast has been 150 days at a minimum. There has also been a large change in the length of the ice season during the past century. In the Bothnian Bay, which has the longest ice season, the trend is −18 days per century. Greater changes have been observed in the eastern Gulf of Finland , where ice also forms every winter; over the past century, the length of the ice season decreased by 41 days per century, while in the past 50 years, it further decreased to −62 days per century. In the southern Baltic Sea, the length of the ice season decreases from east to west and from the inner waters towards the sea areas. A weak trend towards a smaller number of days with ice has been found for the last 30-year period. The changes in ice conditions are consistent with the observed increase in temperature , but some sea-ice changes could also be caused by shipping . Ship-induced waves can prevent the formation of a permanent ice cover in the autumn as well as enhance the break-up of the ice cover during spring; thus, the increase in the size of vessels and the intensity of shipping activity in the Baltic Sea could also affect local ice conditions. The overall change in mean sea level at the Baltic Sea coasts results from the combined effects of post-glacial rebound, the increase in global ocean mass, thermal expansion of sea water, and the contributions of regional factors that may cause an overall change and/or a redistribution of sea level within the Baltic Sea. The glacial isostatic adjustment exerts a strong influence in the Baltic Sea area, with a maximum uplift of the Earth’s crust in the Gulf of Bothnia of approximately 10 mm year−1 and subsidence in parts of the southern Baltic Sea coast of about 1 mm year−1. Thus, relative sea level is decreasing in the northern Baltic Sea region where the continental crust is rising, while sea level is rising in the southern Baltic Sea region where the continental crust is sinking (Fig. 1.6). In addition, many climate factors also influence relative sea level, including changes in water density (driven by changes in water temperature and salinity), changes in the total volume of the Baltic Sea, and meteorological factors. Analysis of individual records of landlocked tide gauge measurements corrected for the vertical land movements indicates that Baltic Sea sea level may have risen during the twentieth century at rates of around 1.5 mm year−1, which are close to the rate of global sea-level rise. However, uncertainty is large because the margin of error of the estimates of land uplift may be locally of the order of 1 mm year−1. An accurate estimate of absolute, climate-induced, Baltic Sea sea-level rise over the twentieth century is still not available, but is unlikely to deviate much from the global average. In more recent decades, as satellite altimetry data have become available, the basinwide rate of sea-level rise may be around 5 mm year−1 (with an uncertainty of roughly ±3 mm year−1) with the central estimate thus higher than the recent global mean of 3.2 mm year−1. Extreme sea level is caused by storm surges driven by the passage of atmospheric cyclones . There is some evidence that the intensity of storm surges may have increased in recent decades in some parts of the Baltic Sea, and this has been attributed to long-term shifts in the tracks of some types of cyclone rather than to long-term change in the intensity of storminess. Analyses of storm surges have focused on local records, however, and there is no systematic basinwide analysis of change in storm surges yet available. Analyses show no significant change in average wave activity in the Baltic Sea basin. However, extensive spatial patterns of changes within the basin exist, possibly leading to long-term variations in areas with the greatest wave intensity. Regional studies have even revealed different trends in average and extreme wave conditions that are probably due to systematic change in wind direction. Regional climate models have been used extensively since the first assessment of climate change in the Baltic Sea region published in 2008, not least for studies of Europe (which includes the Baltic Sea catchment area). Therefore, conclusions regarding climate model results have a better foundation than was the case for the first Baltic Sea assessment. Projections of future climate change make use of general circulation models (GCMs) that describe climate based on a set of grid points regularly distributed in space and time. The grid scale (i.e. the difference between two neighbouring points) of present-day GCMs is in the range 100–300 km. However, many important processes, such as cloud formation, convection , and precipitation, occur on much smaller spatial scales; thus, these sub-grid processes need to be approximated using simplifying algorithms termed parameterisations . To obtain estimates of regional climate, the results of GCMs are downscaled (a process linking large-scale features to small-scale features) with regional climate models (RCMs). RCMs have much higher resolution than GCMs and can better describe local features while still remaining able to simulate the atmospheric state in a realistic manner. Climate models describe statistical features of states of the atmosphere over a long period of time. Climate variations are caused by changes in the environment, including the ocean, vegetation, ice, solar activity, and the composition of the atmosphere, with the strongest emphasis on the concentration of GHGs and aerosols . While some of these changes can be well estimated, others including changes in land cover and GHG concentrations are very difficult to predict. Thus, scenarios of possible future changes in world population and economic activity are developed and used to project how the climate could change in the future. There are many sources of uncertainty in climate model results. These include uncertainty related to future changes in land cover and atmospheric GHG concentrations, the amount and accuracy of input data, and the chaotic nature of weather. Many sub-grid scale processes must be represented in models in a simplified form and are not well described by the models. For example, representations of cloud formation, the optical and radiative features of clouds , and the creation of atmospheric precipitation still carry considerable model error. The skill of methods for describing regional climate futures is also limited by natural climate variability . Non‐GHG drivers, such as aerosols and changes in land cover, are not fully represented in RCMs. This can be a source of major uncertainty in projections of future climate as a large part of the simulated multi-decadal variance in North Atlantic sea-surface temperature depends on levels of aerosols. Natural climate variability limits the skill of future climate predictability in many regions. In locations where the amplitude of natural variability is high, predictability is low, and vice versa. The uncertainty of future climate projections is largely a consequence of the chaotic nature of large-scale atmospheric circulation patterns, and improving models or GHG scenarios cannot eliminate this uncertainty. Scenarios, or projections , represent possible future developments and provide decision-makers with a variety of perspectives to consider when developing plans for the future. Scenarios are not predictions, at least when using IPCC terminology, even though the two terms are frequently confused. For example, the term “prediction” is often used when possible developments are meant. Most regional climate change information from global models has originated in recent years from the World Climate Research Programme’s Coupled Model Inter comparison Project phase 3 (CMIP3) multi-model data set. In CMIP3, about 20 different coupled atmosphere–ocean GCMs were used in a number of different simulations —on natural variability, on the effect of observed increases in anthropogenic forcing during the twentieth century, and on the expected effect of a number of possible increases in anthropogenic forcing (scenarios provided by the IPCC Special Report on Emissions Scenarios; SRES2) for the twenty-first century. Downscaling of global climate model results has been undertaken with a number of RCMs. Such RCM simulations are generally conducted for the atmosphere only, using sea-surface temperature data from the driving GCM. For the case of the Baltic Sea, this is a severe limitation, because sea-surface temperature data taken from global models do not describe the Baltic Sea adequately. Still, there are some clear improvements since the BACC I assessment of 2008: Models now operate at higher horizontal resolution , and the simulations cover a larger degree of the uncertainty range including a wider range of emission scenarios (sampling the uncertainty in forcing), more climate models (addressing model uncertainty), and ensemble members (addressing natural variability). Although there is a large spread between different GCMs, a clear increase in temperature is projected for all seasons (Fig. 1.7). While the pattern of highest warming in the north in winter is similar for all models, there is a spread in the magnitude of change. Changes increase with time and/or rising emissions of GHGs. The land is expected to warm more quickly than the sea. This is particularly the case in winter when retreating snow and sea-ice cover are expected to enhance absorption of sunlight and increase heat storage in the soil, leading to higher temperatures . Cold extremes in winter and warm extremes in summer are expected to change more than the average conditions; implying a narrower (broader) temperature distribution in winter (summer). Precipitation is projected to increase across the entire Baltic Sea region during winter, while in summer, increases are mainly projected for the northern half of the basin only. For the southern part of the Baltic Sea, there is a large spread between the different models including both increases and decreases, and thus, little clear change in precipitation is projected (Fig. 1.8). Extremes of precipitation are also projected to increase. Some projections for the Baltic Sea area that show considerable decreases in average summer precipitation also show an increased likelihood of very extreme precipitation . In addition to increased intensity of extreme precipitation events, RCM simulations also indicate an increased frequency of such precipitation extremes. Projections for future changes in wind speed are highly dependent on changes in the large-scale atmospheric circulation simulated by the GCMs. The results diverge, and it is not possible to estimate whether there will be a general increase or decrease in wind speed in the future. A common feature of many model simulations, however, is an increase in wind speed over oceans that are ice-covered in the present climate, but not in the future. Future changes in extreme wind speed are uncertain. Simulations of extremes of wind speed show an even wider spread than those for mean wind speed. Simulations for the Baltic Sea area clearly show that the volume of snow in the region may decrease considerably in the future, even though a very few Scandinavian mountain areas may experience slight and statistically insignificant increases. There is a possibility that in extreme years the maximum amount of snow could be greater than in extreme years in the climate of the recent past, even if the total annual amount of snow is reduced. The southern half of the Baltic Sea catchment area is projected to experience on average significant reductions in the amount of snow, with median reductions of about 75 %. Future run-off will be influenced by an increase in evaporation owing to higher air temperatures as well as the increase in precipitation expected across much of the Baltic Sea area. A decrease in river run-off is possible despite increased precipitation, if increasing evaporation is the more important factor; but this remains contested due to the low numbers of simulations and the large uncertainties involved. The annual cycle of run-off is expected to change considerably. For areas presently characterised by spring floods due to snow melt , the floods are likely to occur earlier in the year and their magnitude is likely to decrease owing to less snowfall and a shorter snow accumulation period. As a consequence, sediment transport and the risk of inundation are likely to decrease. In the southern part of the Baltic Sea area, increasing winter precipitation is projected to result in increased river discharge during winter. In addition, groundwater recharge is projected to increase in areas where the infiltration capacity is not currently exceeded, resulting in higher groundwater levels. Decreasing precipitation combined with rising temperature and evapotranspiration during summer is projected to result in a drying of the root zone which would drive increasing irrigation demands in the southern part of the Baltic Sea area. Over the past five years, there has been a considerable increase in the number of scenario simulations with respect to the Baltic Sea. Scenario simulations based on three coupled physical–biogeochemical models of the Baltic Sea, forced with atmospheric RCM data downscaled from two GCMs and two GHG emissions (the SRES A1B and A2 scenarios), are discussed below. The greatest changes in water temperature are projected to occur in the Bothnian Bay and Bothnian Sea during summer and in the Gulf of Finland in spring. Using the SRES A1B and A2 scenarios , the summer sea-surface temperature is expected to increase by about 2 °C in the southern parts of the Baltic Sea and by about 4 °C in the northern parts. At least some of the greater change in the northern Baltic Sea is caused by the ice-albedo feedback owing to the decline in sea ice in winter. The surface water layer is projected to warm more than the deep water in all sub-basins of the Baltic Sea. The scenario simulations indicate that salinity may decrease and that changes in sea-surface salinity could be greatest in the region of the Danish Straits, especially in the Belt Sea , and small in the northern and eastern Baltic Sea, with the smallest change in the Bothnian Bay (Fig. 1.9). Changes in sea-surface salinity are projected to be reasonably uniform across seasons. In the Bornholm Basin and Gotland Basin , the reductions in salinity with depth are nearly constant and were 1.5–2 g kg−1 in the ensemble mean; changes in the deep water were greater than in the surface layer in these sub-basins. In more weakly stratified basins, such as the Gulf of Finland and Bothnian Bay, there were greater differences in salinity changes in the surface and bottom layers, causing a reduction in vertical stability. The changes in salinity are due to changes in run-off, and as climate models have severe biases with regard to the water balance, it is still unclear whether Baltic Sea salinity will increase or decrease. Studies of both past and future climates suggest that increased total run-off would increase the ventilation of the upper halocline due to weakened stratification causing improved oxygen conditions in the upper deep water. However, this is uncertain owing to biases in model results for the hydrological cycle . The future reduction of sea-ice cover in the Baltic Sea mainly depends on the projected changes in air temperature during winter. All simulations indicate a drastic decrease in sea-ice cover in the Baltic Sea in the future, in agreement with earlier studies. However, even under a warmer future climate, sea ice is likely to occur in future winters in the northern Baltic Sea. Projected changes in sea-level extremes caused by changes in the regional wind field indicate that at the end of the twenty-first century, the greatest changes in mean sea-surface height would occur during spring, amounting to up to 20 cm in coastal areas of the Bothnian Bay . The maximum change in annual mean sea-surface height is expected to be 10 cm without accounting for the large-scale sea-level rise or land uplift in the Baltic Sea area. Overall, sea-level rise has a greater potential to increase storm surge levels in the Baltic Sea than increased wind speed. Sea levels are rising owing to global warming, primarily as a result of the loss of ice masses on land and the thermal (steric) expansion of sea water. Sea-level rise varies in complex spatial patterns depending on several factors. In addition, relative sea level in the Baltic Sea is influenced by the large ongoing glacial isostatic adjustment resulting from the loss of the Fennoscandian ice sheet at the end of the last glacial period. The magnitude of future sea-level rise is highly contested in the scientific community, and several years may be needed to reconcile the various estimates. More data extending over longer periods are needed, particularly for estimating the contributions from Greenland and Antarctica. The IPCC AR5 report summarises the state of knowledge regarding the global issue, with the change in the Baltic Sea strongly conditioned by these global changes. There is considerable uncertainty in projections of sea-level rise over the twenty-first century and disagreement over the level of confidence assigned to different modelling approaches. BACC II has compiled a mid-range sea-level rise scenario through an assessment of process model projections and uncertainties. The mid-range scenario , based on the SRES A1B scenario, projects a rise of 0.7 m (±0.3 m) for sea level in the Baltic Sea until the end of the twenty-first century. It should be noted, however, that this is one projection from the full range of IPCC projections (0.26–0.82 m for AR5). This potential local sea level rise is partly compensated by vertical land movement which varies between 0 m per century in Denmark and roughly 0.8 m per century in the Bothnian Bay . This section describes the environmental impacts of climate change on the coastal and marine environments of the Baltic Sea basin as well as on atmospheric chemistry. It is shown that most of the observed environmental changes are due to several interrelated factors of which climate change is but one. The main air pollutants addressed in BACC II are the acidifying compounds (sulphur and nitrogen oxides, as well as ammonia/ammonium) and ozone . In general, the main driver of changes in atmospheric concentration and deposition with time is changes in emissions rather than impacts of meteorological changes. The dramatic increase in emissions after the 1940s, in Europe and North America, resulted in substantial changes in reactive nitrogen (Nr) and sulphur deposition, and in ozone levels. Indeed, deposition of Nr species is now of particular concern for the Baltic Sea region. Reductions in emissions in Europe starting around the 1980s have resulted in significant reductions in sulphur and oxidised Nr compounds in the European atmosphere. Emissions of reduced Nr compounds have not declined to the same extent, and indeed in some areas ammonia (NH3 ) emissions are increasing. For the future development of air pollution in Europe, some climate-induced changes are potentially important, however. For example, potential increased shipping activity and new shipping routes within the Arctic may lead to increased nitrogen deposition in environmentally sensitive areas and even to increased phyto-toxic ozone uptake. A new understanding is also that higher temperatures may increase NH3 emissions from evaporative sources over land by very substantial amounts (e.g. 20–50 %); a process that is not yet included in NH3 emission inventories. In summary, while it seems likely that air pollution impacts from sulphur and oxidised nitrogen will be substantially reduced in future compared to recent years, and the situation for ozone and reduced nitrogen is still unclear and strongly dependent on policy developments, that is, future emission control measures, both at regional and (for ozone) hemispheric scale. The ecosystems of the extensive coastal zone of the Baltic Sea are relatively unstable, owing particularly to land uplift and the effects of sea-level rise and drainage basin processes. Furthermore, human influences from the often densely populated coastal areas exert a wide range of impacts on this area. Land use varies greatly within the Baltic Sea drainage basin. The most notable contrast is between the agricultural south and the forested north. Some of the ecosystem responses are specific to the relatively simply structured brackish water ecosystems of the Baltic Sea. The high diversity of the regional geography and distribution of the different habitats must be considered when assessing ongoing and possible future change patterns. The combined effects of climate change and land uplift on coastal ecosystems have been little studied and need particular emphasis in the future. Warmer terrestrial ecosystems and warmer coastal sea water affect the northward migration of terrestrial and aquatic species and result in longer reproductive periods for coastal fauna and flora. The biodiversity of the Baltic Sea is particularly sensitive to changes in salinity, which can have a cascading effect on food webs and interaction between aquatic and terrestrial ecosystems. The effects of climate change on salinity and water temperature can facilitate invasion by non-indigenous aquatic bird species, such as cormorants, which can cause major changes in coastal bird communities. The climate-mediated changes can also facilitate the invasion of mammalian predators which can cause major changes in coastal and archipelago ecosystems. The positive impacts of climate change on forest growth are expected to continue. In relative terms, boreal forest stands may benefit more from climate change than temperate forest stands. The Baltic Sea drainage basin is likely to undergo a change in the species composition of natural vegetation , with a predominantly northward shift of the hemi-boreal and temperate mixed forests. Projected losses of species are greater in the southern part of the Baltic Sea basin than in the north. Terrestrial carbon storage is likely to increase in the Baltic Sea catchment area. However, land-use change can play an important role in the terrestrial carbon cycle and have both positive and negative impacts on carbon storage . The effect of climate change on freshwater biogeochemistry and riverine loads of biogenic elements to the Baltic Sea is not straightforward and difficult to disentangle from other human drivers such as atmospheric deposition , forest and wetland management , nutrient loads from agriculture , municipalities and industry, and hydrological alterations by, for example, hydroelectric dams. Climate change is a compounding factor for all major drivers of freshwater biogeochemistry. The evidence for assessing the effect of climate change is still often based on small-scale studies in both time and space; however, qualitative assertions are possible. The change in the seasonal distribution of the discharge regime of major boreal rivers has potentially large impacts on the redistribution of organically bound carbon and nutrients from land to sea. Areas with a mean annual temperature around 0 °C (i.e. around 61°N) are most sensitive to further warming. Atmospheric deposition in the past decades probably had a stronger effect on freshwater biogeochemical conditions in the Baltic Sea drainage area than climate. However, this pattern may change as atmospheric deposition decreases. Over the short term, climate change is unlikely to affect the spatial distribution of wetlands , except for palsa mires that cover too small an area in the boreal watersheds to be significant for element fluxes to the Baltic Sea. Results from small-scale field and modelling studies indicate that increased temperature and precipitation could increase the transport of dissolved organic matter to the Baltic Sea significantly. However, the large-scale impacts on the Baltic Sea basin are still unknown. Even a northward shift in boreal forest (i.e. Norwegian spruce) with climate change may alter quite significantly the biogeochemistry of the northernmost rivers over the long term. Agricultural practices and urban sources have significantly increased nitrogen and phosphorus concentrations in the rivers draining the cultivated watersheds of the southern Baltic Sea catchment. Changes in climate are not uniform across the cultivated southern catchment area; in the south-western part (i.e. Denmark and western parts of Germany), precipitation has increased since the 1980s and farmers are currently adapting to a warmer and wetter climate by selecting heat-demanding and nutrient-demanding crops like maize . Transitional countries such as Poland and the Baltic States may increasingly use fertilisers as a result of the European Common Agriculture Policies and change to a more meat-eating lifestyle which may lead to an increased nutrient flux to the Baltic Sea. Initial studies (that still need further scientific elaboration) indicate that total nitrogen fluxes to the Baltic Sea may increase by up to 70 % as a result of changes in water discharge and changes in lifestyle (including change in the demand for animal protein). Biogeochemical processes in the marine environment of the Baltic Sea are mainly controlled by the biological production and decomposition of organic matter taking place in the context of the hydrography of the region. Carbon , nitrogen, phosphorus, and oxygen are the major elements in these processes, and their distributions and concentrations strongly influence the ecosystem of the Baltic Sea. Enhanced anthropogenic nutrient inputs via rivers and atmospheric deposition during the past century have resulted in major changes in the biogeochemistry of the Baltic Sea. Although the implementation of reduction measures since about 1980 has decreased inputs to a level that is comparable to that in around the 1960s, this is only reflected in a decrease in the nitrate concentrations in the winter surface water of the Baltic Proper. This is not the case for phosphate concentrations, which can partly be explained by the enhanced recycling of phosphate due to increased areas of anoxic water. The increase of atmospheric carbon dioxide (CO2) from 280 ppm during the pre-industrial era to a level of almost 400 ppm in 2010 has led to a corresponding increase in the mean pCO2 in surface water. In marine systems, this would be expected to cause a decrease in the pH by 0.15 units; however, the increase in alkalinity in the central parts of the Baltic Sea over the past 60 years has diminished this decrease by roughly 0.03 units. There is still limited knowledge of the impact that future changes in climate and other anthropogenic drivers may have on the biogeochemical cycles of the Baltic Sea. Various factors may influence these cycles in different ways. Changes in precipitation and run-off patterns will influence the inputs of nutrients, alkalinity, and organic matter to the Baltic Sea. Higher temperatures will decrease the solubility of oxygen in sea water as well as accelerate many biological and biogeochemical processes. Future warming is expected to increase hypoxia given that temperature controls the stratification of the water column, the respiration of organisms, and the solubility of oxygen. Increasing areas of hypoxia and anoxia are anticipated owing to the increased nutrient inputs due to increased run-off, the reduced oxygen flux from the atmosphere due to higher temperatures, and the intensified biogeochemical cycling including mineralisation of organic matter. Model simulations of scenarios concerning the future biogeochemistry of the Baltic Sea have estimated that, taking into account climate change, the implementation of nutrient reductions according to the Baltic Sea Action Plan will result in a slight decrease in the deep-water area covered with hypoxic and anoxic waters. In contrast, the ‘business-as-usual’ nutrient input scenario yielded an approximate doubling of the anoxic area. Simulations of the possible future development of the pH in the Baltic Sea (Fig. 1.10) showed that the rising atmospheric CO2 concentrations mainly control future pH changes in the surface water, while eutrophication and enhanced biological production would mainly enhance the seasonal cycle of pH. All CO2 emissions scenarios studied yielded a significant decrease in pH by the end of this century. Increase in sea-surface temperature has been suggested to change seasonal succession and induces dominance shifts in primary producers in spring. Shifts in dominant species may affect the biogeochemistry and functioning of the pelagic ecosystem in the following summer. As increasing temperature and stratification also favour cyanobacteria , rotifers, and small cladocerans, the plankton community is projected to shift towards smaller sized organisms. Mesocosm studies also suggest that climate change may influence the seasonal succession of phytoplankton and zooplankton , potentially increasing the temporal mismatch between these groups in spring. Such changes may have negative consequences on zooplankton production and thus food conditions of planktivorous fish. A climate-induced decrease in salinity together with poor oxygen conditions in the deep basins would negatively influence the main Baltic Sea piscivore, cod. Several studies have confirmed that this causes cascading effects on clupeids and zooplankton. It is less clear whether the effects cascade from zooplankton to phytoplankton. Reduced duration and spatial extent of sea ice would cause habitat loss for ice-dwelling organisms, affect the ice-modulated land–ocean interactions, and probably induce changes in nutrient dynamics within and under the sea ice. There are, however, no estimates of the effects of declining sea ice on the overall productivity and pelagic–benthic coupling of the Baltic Sea ecosystem. Modelling efforts suggest that climate change could worsen eutrophication by increasing freshwater discharge and thereby nutrient loads from land. An increase in sea-surface temperature would probably also favour cyanobacteria that binds nitrogen from the atmosphere and increases the supply of nitrogen to the nitrogen-limited phytoplankton. Summer primary production and sedimentation would then increase, worsening oxygen conditions and inducing the release of phosphorus from sediments . On the other hand, increasing the supply of freshwater and associated dissolved organic carbon may also reduce phytoplankton productivity, at least in the Gulf of Bothnia. Thus, it is clear that the effects of climate change on the productivity of the marine ecosystem vary from basin to basin. Some of the most profound effects of the projected salinity decline involve losses in functional diversity that would accompany the loss of marine elements in the fauna. Also, the potential increase in primary production and sedimentation of organic matter in the northern Baltic Proper , as well the climate-driven decrease in trophic efficiency, as suggested for the Gulf of Bothnia, are potentially important factors for benthic communities . Acidification associated with high concentrations of CO2 in the sea may also have severe implications for calcifying organisms such as bivalves. Key physiological processes including growth, metabolic rate, reproduction, and activity are also likely to be affected, thus potentially affecting the abundance, diversity, and functioning of benthic communities. Human-induced pressures, such as overfishing and eutrophication , may erode the resilience of the Baltic Sea ecosystem, thereby making it more vulnerable to climatic variations. The Baltic Sea communities, that are poor in both species and genetic diversity, may therefore be particularly vulnerable to external forcing factors caused by the climate change. The Baltic Sea features a large variety of shorelines, from bedrock-dominated coasts to soft depositional shores. The response to climate-related changes differs for the various shore types in the Baltic Sea which include chalk cliffs , rocky shores, barrier islands with coastal lagoons, sandy beaches, flat clay shores, and esker shores. The response of the coasts to climate change varies over different timescales, owing to changes in local dynamics or geo-morphological conditions as well as to the intensity of the driving forces. The main drivers of change in coastal geomorphology are geological structural resistance, changes in sea level , long-shore currents, and storm surges. These factors are responsible for both coastal erosion and accumulation, as well as for the emergence and variability of beaches. Identifying the contribution of climatic change to geomorphic changes can be difficult and will also vary regionally. Coasts are particularly vulnerable to extreme events. The impact of wave energy on a shore depends on its exposure to the open sea and thus the potential for wave formation. The formation of sea ice also influences the shores of the Baltic Sea. Ice usually forms first in shallow inland bays, and the contact of the sea ice with the shore can cause local erosion. Simulations that project warmer winters indicate significant changes in ice conditions in the Baltic Sea, with the consequence that the interaction of the shores with sea ice may become less important, while the impact of wave energy may become more important. These changes would have a significant impact on coastal morphodynamics and ecosystems. Maritime activities and shore protection also cause physical stress on the shoreline, particularly on shallow coasts and archipelagos . The low coasts of the Baltic Sea will be strongly affected by sea-level rise. Soft cliffs are also eroding due to heavy rain and storm surges. The combination of high water levels with strong wind can result in severe damage to soft coastal cliffs. Coastal erosion reduces the habitats for plant and animal communities, such as dune environments. In summary, the effects of climate change would include losses of sediment for coastal rebuilding , losses of valuable natural habitats , economic value and property, coastline changes due to extreme storm events, and increasing costs to society in terms of coastal protection measures. The Baltic Sea basin is home to a diverse range of human activities that may all be affected by climate change in one way or another. The socio-economic impacts of climate change on the scale of the Baltic Sea basin have been the subject of a limited number of international and national studies. Two aspects are discussed here: impacts on the managed rural landscape (i.e. agriculture and forestry) and impacts on urban complexes (i.e. cities and towns). Climate change affects the vulnerability and productivity of agricultural and forestry systems predominantly through changes in precipitation and temperature patterns, and by changes in the frequency and intensity of risk factors for damage such as droughts , floods, storms, and biotic disturbances like pest infestations. In addition to changes in environmental factors, changing energy policies may influence agricultural and forestry systems through changes in demand for biomass for use as a biofuel. Effects differ with location, with growing conditions tending to improve in the northern boreal zone , with reduced precipitation and higher temperatures tending to result in deteriorating growing conditions in the southern temperate zone . Changing growing conditions are likely to cause shifts in forest structure and diversity. The importance of adapting management practices to altered conditions is clear and may allow increased yields and economic benefits as well as climate mitigation through substitution of fossil fuel energy with bioenergy . Evidence suggests that this is particularly the case for the northern parts of the Baltic Sea basin, while in the south, the potential for improved growing conditions might be counteracted by water stress and reduced growth in sensitive species such as Norway spruce. The need for management adaptation is especially clear in the south, in terms of change in thinning regimes, rotation periods, and species selection. Conclusions on socio-economic impacts cannot be generalised because potential yield increases as well as loss risks from more unfavourable conditions must be considered. On the other hand, investment in better transport infrastructure in the north and the higher risk of storm damage, with market distortion, risk of species die-back, and more frequent bark beetle damage necessitating costly salvage cuttings, would be a considerable burden to forest management , increasing the need for planting where natural regeneration of current species is no longer suitable. A general decrease in tree age at harvesting may also decrease risk, irrespective of whether clear-cutting or selective cutting is practised. Overall, the results highlight the importance of adaptive forest management strategies in the Baltic Sea basin and show positive benefits for forest management and conserving biodiversity . This could be of particular importance as management practises become more intensive, increasing the need to consider other aims (such as biodiversity and carbon mitigation). It is clear from several studies that the effects of climate change on agricultural production in the Baltic Sea basin are likely to be mainly positive for crop yield , especially for winter crops. However, increasing climate variability will lead to a need for adaptation measures. These are manifold and will differ among region and crop species. Urban complexes, that is, cities and towns, are characterised by high concentrations of buildings and built-up areas with consequent soil sealing, high concentrations of people and infrastructure as well as specific economic and cultural roles and activities. As every particular urban complex is characterised by a specific mix of social, ecological, and economic interdependencies and its specific settlement and building structure, it is difficult to generalise scientific findings on urban complexes. Climate change impacts are determined not only by the specific structures of these urban complexes, but also by the vulnerability of the urban society , its socio-economic and institutional structure as well as infrastructure and its capacity to cope with impacts. Urban areas are usually characterised by higher temperatures than the surrounding countryside. Urban cold islands, where built-up areas are colder than areas outside the city core, also appear. These effects are not unique over the entire urban area and depend on urban land use . Moreover, climate change is not the only driver of change in urban complexes as they are also influenced by, among others, demographic change, changes in land use, and political and economic changes, which are interacting with climate change impacts. For urban complexes in the Baltic Sea catchment, several climate change impacts are expected in very different fields such as on urban services and technical infrastructure, on buildings and settlement structures, on the urban economy , and on the urban population. The impacts differ based on the location of the urban complexes , whether they are in the northern or southern part of the catchment and directly at the Baltic Sea coast or inland. Specifically, sea-level rise is a main impact for coastal cities, especially at the southern Baltic Sea coast, threatening urban infrastructures and settlements and in some cases also the urban drinking water supply through the intrusion of saltwater into coastal aquifers. Changing precipitation patterns, heavy precipitation, and storm surges as well as rapid snow melting events can cause severe further problems for urban infrastructure and urban settlements through surface floods, rapid surface run-off, and changes in water quality and availability. Transport is especially vulnerable to flooding (through storm surges and heavy precipitation events) and sea-level rise. Heat stress and changes in air quality are expected to affect the urban population directly. A new issue in BACC II is the question: Is there evidence that recent change is beyond natural variation, so that it may be concluded that external drivers are at work (‘detection’); and if so, which mix of such external drivers is most plausibly responsible for this change (‘attribution’) . The drivers considered are global climate change, changing atmospheric aerosol loads and changing land use . Although there is a small amount of literature available on the impact of global climate change on the Baltic Sea region, for the other two issues scientific literature exists on mechanisms, but virtually nothing on quantitatively linking changing aerosol loads and changing land use to changes in the regional climate. There is some indication of an emerging anthropogenic signal, which is detectable in thermal quantities such as seasonal temperature, but evidence for detection of changes in non-thermal quantities such as circulation and precipitation is weak. Although human influence (mainly increasing concentrations of GHGs) has been identified as a cause of the recent warming in the Baltic Sea area, there are caveats. The causes of recent circulation changes in the Euro-Atlantic sector are not yet understood, and therefore, attribution of changes especially in winter and spring is to be treated with caution. Furthermore, quantification of the contribution of individual drivers has not been accomplished. Better understanding of the regional effects of natural drivers and the effect of anthropogenic aerosols may help to achieve quantified attribution statements. Finally, detection and attribution efforts are often subject to selection and publication biases . That is, time series with ‘interesting’ behaviour are preferentially studied and positive findings (of a detectable anthropogenic effect) are more likely to be published. To avoid these biases, systems to routinely issue statements on the contribution of external forcing to the observed climate across a range of pre-specified variables and regions are needed. Scientific understanding of aerosol effects on the global and regional climate is still accumulating. Targeted analyses on regional aerosol effects in the Baltic Sea region are rare, and commonly used regional climate models are generally unable to simulate aerosol–climate interactions. Anthropogenic aerosol emissions are mainly concentrated in heavily populated and industrialised regions. The Baltic Sea area contains such regions, which implies a considerably higher regional climate forcing. Major reductions in emissions of sulphur and nitrogen compounds have already been achieved, black carbon emissions will probably decrease far more, as will organic compounds emitted from the same combustion sources. As a result, the total climate effect from the expected changes in aerosol emissions will probably be minor, while emission reductions strongly affecting ozone and methane concentrations may reduce climate warming significantly. However, ozone and methane concentrations over Europe and the Baltic Sea area are strongly dependent on emissions over the northern hemisphere and the world as a whole, respectively. Analyses on regional aerosol effects in northern Europe are rare, and the commonly used regional climate models are mostly unable to simulate aerosol–climate interactions. However, recent modelling efforts investigating the influence of European aerosol emissions indicate an effect on large-scale circulation over Europe that is very likely to have affected the climate in the Baltic Sea region. To what extent is still not known. Development of the modelling capability and targeted analyses are urgently needed to reduce uncertainties related to the effect of changes in aerosol concentration on regional climate. Anthropogenic land-cover change is one of the few climate drivers for which the net direction of the climate response (warming or cooling) over the past two centuries is still not known with certainty. The major uncertainty is due to the often counteracting temperature responses to biogeochemical versus biogeophysical effects, but also to the difficulty of quantifying the counteracting effects of changes in albedo and hydrological cycle (both biogeophysical effects), as well as obtaining precise land-cover data for the past. In particular, land-cover change affects the exchange of heat between the land and the atmosphere (biogeophysical effect) and the sequestration of CO2 (biogeochemical effect). These two effects often have opposite consequences on climate (mainly temperatures ) for the same vegetation change. However, these are only two of many biogeophysical and biochemical effects. Different biogeophysical effects may also have opposite results on the climate between them. Depending on the respective size of all biogeophysical and biochemical effects, the net result will be a warming, a cooling, or no change. While no quantitative studies are available for the Baltic Sea region on the effect of changing anthropogenic land-cover since the beginning of industrialisation, there is ample evidence that important land-use changes have taken place in the past in this region. The most substantial deforestation of the region occurred about 2500–2000 years ago as indicated by palaeoecological evidence; later, deforestation gradually increased until the nineteenth century. The net effect of this long-term deforestation on past climate, at the global or regional scale, is debated but still unknown, as is the net effect on climate of the reforestation of the nineteenth and twentieth centuries (by spruce and pine plantations) in the southern part of the Baltic Sea region. A study on land cover–climate interactions in Europe 6000 and 200 years ago, using a regional climate model , indicates that anthropogenic land-cover changes between these two time frames had significant effects on climate and that the effects differed between seasons and regions. Other modelling studies show that simulated large-scale afforestation of the northern hemisphere leads to an albedo-induced global mean warming that would offset the cooling due to the reduction in atmospheric CO2 through sequestration by trees. Studies on land cover–climate interactions in the northern hemisphere and reconstructions of past human-induced land-cover change in the Baltic Sea region suggest there is no evidence that anthropogenic land-cover change would be one of the factors responsible for the recent warming in the Baltic Sea region. Baltic Earth is the successor to BALTEX, the scientific network dealing with meteorological, oceanographic, and hydrographic issues in the Baltic Sea basin. BALTEX was concluded in June 2013, and Baltic Earth has been established with a broader agenda of bringing together scientists interested in the dynamics, the past and possible futures of the Baltic Sea basin (www.baltic-earth.eu).